Oil and gas producers have been losing on average 3–5% of their production to unplanned downtime over the past years. With the advancement in technology, companies can leverage Predictive Technology to significantly improve business performance through improved asset reliability and reduced unplanned downtime. Whether the asset is an offshore pumping station, compressor or drilling rigs, predictive analytics enables modelling of equipment behaviours using advanced pattern recognition and machine learning algorithms to identify and diagnose any potential operating issues days or weeks before failures happen. Learn how Industry 4.0 and Asset Performance Management solutions, including predictive maintenance, mobility, augmented reality (AR) and virtual reality (VR), empower companies to: 1) Improve asset ROI through early warning of asset failure before it happens, reducing unplanned downtime and improving asset availability 2) Reduce operations and maintenance costs 3) Extend equipment life and increase asset utilization. Coiled-tubing (CT) technology dates back to the 1950s and was initially developed for working on live, producing wells. More recently, CT technology has gained acceptance among operators for a wide range of applications and for its ability to reduce overall costs. This webinar will cover modern coiled-tubing technology and techniques, economics, and safety as well as CT equipment and intervention services such as stimulation, wellbore cleanout, logging, perforating, fishing, nitrogen kickoff, sand control, cementing, well circulation and mechanical isolation. 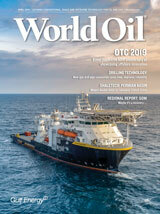 Through a combination of optimized and standardized well design, risk mitigation and cost reduction, operators continue to push the boundaries of deep water exploration both in terms of geographical frontiers and technological advances to confront increased temperature and pressure. This presentation will provide some examples of OCTG well designs of pipe and connections being used to support deepwater projects along with additional critical considerations to ensure the weakest point of the string is understood. By incorporating actual pipe information, we can look to support operators to allow the potential build of a digital well. The digital well is Vallourec’s latest development to support deepwater and critical operations, to improve efficiency and generate the best results. During this 60 minute live webcast, Moderator, Joe D. Woods, President, International Pinpoint, will lead discussion on these topics: 1) “Technology to Improve Performance and Lower Cost in Water Management Applications”, with presenter, Jeff Wilhelm, Sr. Vice President Artificial Lift & Water Management, GR Energy Services. 2) “Produced Water Reuse”, with presenter, Mark Patton, President and CEO, Hydrozonix. 3) “The Future is Now: Water Automation in the Oilfield”, with presenter Nate Banda, Vice President of Technology, Select Energy Services.